The Gem and Jewellery Export Promotion Council said it will suspend Nirav Modi and Mehul Choksi from the Council in case they fail to respond to its notices over the Rs 12,000-crore Punjab National Bank fraud by March 9th. The Council had issued the first show-cause notice to both Modi and Choksi in early February, but has not received any explanation from them. It has again issued another notice this week. 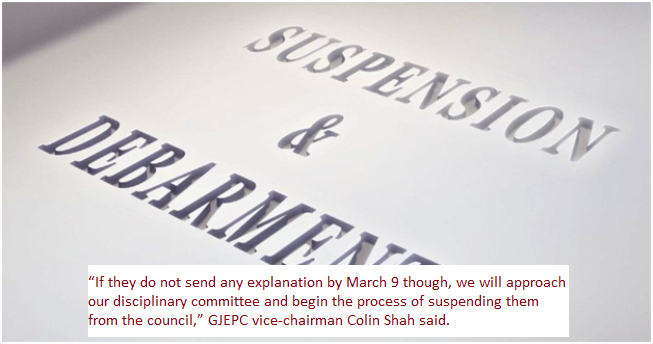 �If they do not send any explanation by March 9 though, we will approach our disciplinary committee and begin the process of suspending them from the council,� GJEPC vice-chairman Colin Shah said. Shah said there are legalities to the entire procedure and the Council will act accordingly. According to Shah, GJEPC has also submitted suggestions to the government on how to make stringent norms to avoid any financial irregularities relating to the industry in future. �We are meeting with officials in the Commerce, Finance Ministries and Bankers and have submitted our suggestions last week on how to strengthen the processes to avoid any kind of fraudulent practices in future. Discussions are on and we hope something concrete will come up within a few weeks,� said Shah. Modi, his uncle Choksi and others are being investigated by multiple probe agencies after the scam recently came to light following a complaint by the Punjab National Bank (PNB) that they had allegedly cheated the nationalized bank of over Rs 12,000 crore. Meanwhile, Shah said, the industry, which has a major chunk of small and medium-sized enterprises, is already struggling for finance and this incident has further made the situation difficult for them. �These are small companies who are looking for Rs 10-50 lakh. We hope this hurdle faced by these SMEs, which are lifeline of our trade, will not affect the trade in any way,� he said.